One thing that is a definite – every manufacturer’s new product line buzzword is “improvement”. Improvement in distance, feel and shots. 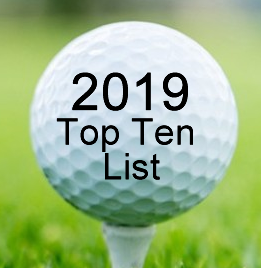 The golf equipment category revolves among the major players such as Callaway, Mizuno, Nike, PING, Titleist, and TaylorMade, however, companies such as Tour Edge, Cleveland, Wilson and Cobra also produce excellent equipment. Chrome Soft Ball. The cover of the ball features a proprietary Softface Core with a Tour urethane cover. The stated compression is 65, whereas, the SuperSoft ball, recently introduced, is 35! The three-piece construction Chrome Soft features a revolutionary SoftFast core that delivers a combination of soft feel, high ball speeds, low spin for longer distance and exceptional control around the greens. This 65 compression core Tour ball also features a high performance ionomer mantle in the intermediate layer of the ball to provide fast ball speeds. Callaway’s softest ever DuraSpin urethane cover ensures Tour-level control around the greens and strong durability, as well as patented HEX aerodynamics to generate low spin off the tee. Our testing group found many similarities to the Titleist Pro V1. Using the motto “Built for Outrageous Speed”, Callaway’s newest introductions and innovations in irons and woods, are most definitely raising their market share and stand ready to move Callaway back into the top spot among manufacturers. Add in Odyssey Putters, and this claim is solidified. Callaway’s XR drivers, fairway woods and hybrids employ their new-and-improved Hyper Speed Face Cup technology to produce faster ball speeds — without skimping on forgiveness. The new Hyper Speed Face Cup has an even thinner, lighter face than its predecessors. The lighter face gave Callaway engineers the ability to move the center of gravity (CG) slightly lower in the club heads, as well as add a bit more perimeter weighting. The results? Higher-launching, lower-spinning shots and club heads that are more consistent on mishits. Callaway’s XR and XR Pro irons use the company’s new Hyper Speed Face Cup 360 technology which improves ball speed and forgiveness for longer, more consistent iron shots. Different from the hollow-bodied Big Bertha irons introduced last fall, the XR irons have a slimmer, cavity-back profile, while the XR Pro irons are even slimmer — some golfers would call them blade-like, or player’s irons. 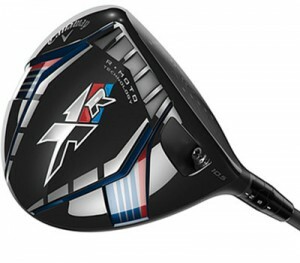 The XR Driver uses a “Speed Step Crown” + R*MOTO Face + LZ Shaft which, according to Callaway, produces up to 5mph more ball speed versus the 2012 Callaway driver. For Callaway’s engineers, the object of the exercise was to reduce aerodynamic drag (the way air flows across the top of the club head) during the downswing and to boost the swing speed. The XR Hybrids feature a new shape and have a much lower CG than previous hybrids and also uses the Hyper Speed Face Cup 360 technology that’s easier to hit and definitely longer. The putter genius/maestro now has a new standout performer – his H2 wedges. H2 represents one of the softest feeling wedges on the market and offers a match to the Cleveland 588 RTX 2.0 and Vokey Design SM5, wedges. Using a forging technology, the company has now produced wedges that look, feel and perform nearly the same as the fully milled models, but for less than half the price at $180 in satin nickel and $195 in cashmere bronze. 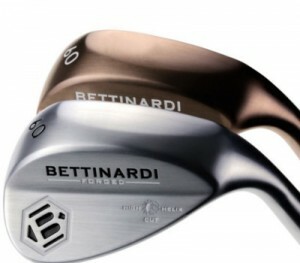 I consider these wedges to be the standouts heading into the new season. There may only be one grind available, but the C-Grind not only looks superb at address in both satin nickel and cashmere bronze finish, but presents you with a versatile wedge that can play all the shots around the green. H2 is more suited to the better player, however, and to someone who is looking for a high-performance, precision-forged wedge. Players who crave a little more forgiveness in the short game will likely want to look elsewhere at wedges offering more bounce options. It’s been quite a while since Bridgestone introduced a driver. 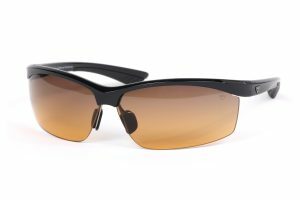 F.A.S.T Crown ·The Flex Action Speed Technology (F.A.S.T.) crown is extremely thin near the clubface and progressively thickens towards the club head rear to enable the crown to slightly flex at impact creating higher launch and increased repulsion. The Power Milled Face is a patented face-milling pattern that works to reduce the common ball slippage at impact – a problem that many drivers encounter today. Maintaining the ball’s position of impact leads to increased quality compression time that results in reduced spin (200-300 RPMs based on robot testing) for straighter and longer drives. Spin Flight Control Technology consists of movable weights on multiple axes in the heel and center of the club head that allow users to customize the center of gravity for desired spin and trajectory. The Variable Adjust System – the J715 is completely Face and Lie angle adjustable, offering face angle adjustments of up to 1° (closed and opened) and lie angle settings of standard, 1° upright and 2° upright. 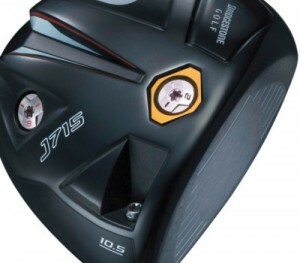 The J715 Driver is available in 8.5, 9.5, 10.5 and 12-degrees of loft and will be the first Bridgestone driver in the U.S. available in both left and right hand versions (left hand available in 9.5 and 10.5 lofts only*). There are two adjustable weights in the sole of the J715 driver, and the club comes with a kit that includes 2-, 4-, 6-, 8-, 10-, and 12-gram weights. The J715 driver comes standard with the Mitsubishi Fubuki™ ZT shaft and custom yellow Golf Pride Tour Velvet grip. The Vapor irons consist of three models: Vapor Pro, Vapor Pro Combo and Vapor Speed. All are currently available. All the lines of the Vapor Series are available in Mitsubishi Rayon Fubuki Z 70 graphite shafts or True Temper Dynamic Gold Dynalite 105 steel shafts. The Vapor Pro is intended for more accomplished players such as Rory and Tiger. The Pro incorporates tungsten plugs that move its center of gravity closer to the center of the clubface and improves results on mishits; most traditional blade designs have a center of gravity closer to the hosel. 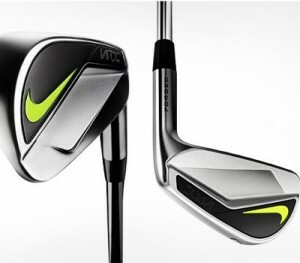 The Vapor Pro irons consist of a carbon steel forged construction with precision-machined grooves. The long irons have a slightly longer blade length designed for additional forgiveness. 3- PW with Steel shafts. For higher handicappers, the Vapor Speed irons, are the best game improvement irons on the market! They are designed for maximum forgiveness and distance and they are, in the opinion of our testing group, the easiest and most responsive irons to hit, ever produced by Nike. The Vapor Speed iron has a polymer-filled cavity with a slightly larger clubface profile than the Pro Combo. A center of gravity that is low and back from the hitting surface launches the ball higher and farther, a significant benefit when greens in regulation are at a premium for most amateurs. An extra benefit of these irons is that mis-hit shots are less punitive. FlyBeams, a Nike term for a pair of supporting bars, are behind the face on the back of the club and are strategically located to increase stability and deliver additional ball speed. The Vapor Speed’s 8-iron through wedge transition into pocket-cavity irons for more precision and feel on shorter approach shots. 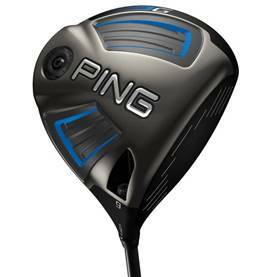 The cavity behind the face is filled with resin material that is lighter and softer than the steel found in the rest of the club; the resin keeps the ball on the clubface longer and softens impact for enhanced feel. The Vapor Pro Combo irons, positioned between the Pro and the Speed sets, is a progressive set with more forgiving clubs in the longer irons and more traditional clubs in the shorter irons. Stunningly great looking shoes with all the latest shoe innovations in technology and performance built in, and amazingly lightweight support and cushioning. Most athletic shoes are constructed with soft, mesh upper materials which are perfect for running and activities that don’t require a lot of lateral movement. For FJ’s R&D team, the key was to keep those comfort qualities in place, but also to deliver the support, stability and waterproof qualities required for golf. Through extensive testing, this balance was achieved utilizing an engineered material never before used in golf shoes. FJ has dubbed it: FlexGrid. FootJoy maintains that the FlexGrid was actually inspired by a suspension cable bridge in Boston, Massachusetts – the Leonard P. Zakim Bunker Hill Bridge. When viewing this type of bridge at different angles, the cables form a grid of tremendous strength and support, all while maintaining a sleek, lightweight and technical appearance. The FlexGrid system begins with a base layer that consists of a tight-knit, lightweight, soft, flexible, waterproof mesh which allows for maximum comfort, breathability, flexibility and air- flow. That layer is (literally) supported by the very noticeable FlexGrid exoskeleton “cage” which conforms to the foot and allows it to flex and expand, but is also strong enough to keep the foot from rolling laterally during the golf swing. The end result is a very unique shoe that wraps your foot in the comfort you expect from an athletic shoe with the support of a high-performance golf shoe. FootJoy’s Boa device will also be available for those golfers who have come to love and enjoy the flexibility and comfortability the Boa offers. As for colors, black looks solid, White/Gey/Blue as always, looks elegant, while the Navy/Lime and Grey/Orange colored shoes will definitely appeal to the Millennials and kids. Part Two will feature primarily the soft goods side of the market, such as clothing, as well as those highly technological products, such as wearable technology, GPS based products and of course, new training aids. 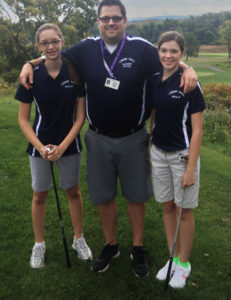 Barry Lotz, J.D., Ph.D. is the director of the Professional Golf Teachers Association of America. He is a member of the Golf Writers Association of America, the California Golf Writers Association, and currently works as a mental coach to 14+ PGA Tour Pros. 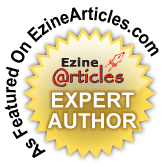 He is also the author of numerous books, including “333 Best Web Sites for Golfers”, “How to Build Business Relationships through Golf” which is in the Top Ten Golf Business Book’s bestseller list. His latest book,” The Right Mind for Golf”, released last year, is now in its 6th printing and available on Amazon. This entry was posted on Wednesday, February 25th, 2015 at 11:42 pm and is filed under Golf Equipment Reviews. You can follow any responses to this entry through the RSS 2.0 feed. Both comments and pings are currently closed.